“Photography is my passport to life,” says Suzanne Vlamis, who has dedicated more than five decades to the craft. She fell in love with the opportunities photography presented to explore the world, and has focused on both natural subjects, like landscapes and wildlife, and man-made subjects, like architecture and cultural events. Ms. Vlamis is currently pursuing her passions as the owner and director of Suzanne Vlamis Photography, an environmental photography company. She has also lent her services as a science and health researcher to Dr. Joy C. Zagoren, PhD, since 1999. 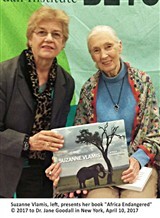 Recently, Ms. Vlamis turned the work she’s been doing into her first book, “Africa Endangered,” published in 2017. She hopes her efforts will promote the appreciation, awareness and advocacy of Africa’s endangered species, indigenous cultures, and natural habitats. Her next focus is Antarctica. Ms. Vlamis started her prestigious career as the copy assistant to the features editor at Brides Magazine, part of the Condé Nast empire, in 1967, the same year she began freelancing as a photographer in New York City. She transitioned to become the editorial assistant to Victor Riesel in 1969, and, in 1973, her freelance work paid off. That year, Ms. Vlamis joined the Associated Press as a staff photographer as the first full-time female in the role. She greatly enjoyed her time there, and moved up to positions like news features supervising photo editor and special projects editor of the Associated Press photo archives. She retired in 2009. Over the years, Ms. Vlamis has had the honor of taking photos during the presidential inaugurations of Richard Nixon, Gerald Ford, Jimmy Carter and Ronald Reagan, covering events like the 1976 and 1884 Summer Olympics, and leading projects on the restoration of the Statue of Liberty, the Centennial Restoration of St. Patrick’s Cathedral, and the building of the Equitable Tower. Besides the Associated Press, her work has appeared in prominent publications like the New York Daily News and Fortune Magazine. To prepare for her endeavors, Ms. Vlamis earned a Bachelor of Arts in English with a minor in sociology from Long Island University in 1966 and completed coursework the School of Visual Arts and The New School. In 1989, she partook in an intensive film summer workshop at New York University. The highlight of Ms. Vlamis’s academic experience was having the opportunity to work with prominent photojournalists Ken Heyman and Josef Breitenbach. In light of her achievements, Ms. Vlamis was highly regarded amongst her peers. She was honored with the Associated Press Managing Editor Award for Top Feature Photography in 1989 for her images of the Statue of Liberty historic restoration, and first prize from the New York Press Photographers Association in 1979 for her feature story, “Centennial Restoration, St. Patrick’s Cathedral.” She also won the Photographers Sports Award from the World Press in 1975, and was featured in Who’s Who in America and Who’s Who in the World. When Ms. Vlamis has spare time, she enjoys collecting fine arts and illustrated books and preserving photos. She also pursues hobbies like yoga, dancing, swimming, scuba diving, and traveling.